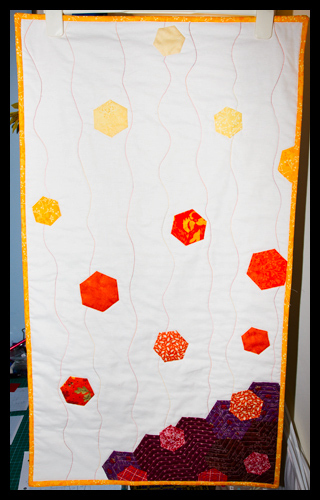 This is the wall hanging I made for the Table Runner And Wall Hanging Swap that Jenna is running. My partner confounded me slightly by stating one set of preferred colour choices, and then having an inspiration mosaic in totally different colours lol. Anywho, she declared that she liked the pile of fabric I pulled, so that was a relief! I got the feeling from her mosaic that she’s a modern sort of a girl, but I have to admit my thought processes were a little off-piste getting to this final design. With the colours my partner chose I just had visions of falling leaves, and then I thought for a bit of a twist I’d go for tumbling hexies. I was originally going to have a tree in there too, but when I cut all my hexies out of paper and started playing about with layout I decided to forgo the tree, and just go for a pile of ‘leaves’ from the darkest colour in the bottom colour and working up. For the ‘fluttering down’ part I graduated the colours from pale yellow down through orange, and quilted by stitching in the ditch around each hexie in a neutral colour before getting a spool each of red and orange variegated thread and did meandering ‘fluttering’ movement lines. For the leaf pile I echo quilted each of the red hexies individually, and then echo quilted the ‘leaf pile’ following the top edges. Your quilt is great and you hold your own with all the other "fishes"! So glad you shared your quilt and story. Very clever concept and you executed if very well. Lovely quilt. I hope your partner was suitable impressed (and jumping up an down happy!). I like your style! This is really cute and good color selections. Great design! And the quilting does give one a sense of movement. Katy you are making far too much of a splash in the quilting pond to be considered pondweed!! Another lovely finish, and a fab idea! This is far from a beginners quilt and is totally fab!! Well done you! Oh I like being obeyed – it doesn`t happen very often. So glad you decided to join in Katy and I love your wall hanging. For someone who considers herself a newbe you've done a wonderful job on this quilt. It's lovely. please if you're a pondweed, then I'm below a pondweed (pond ick??) haha love this design I was following along to see what you were going to do with it! Love it! very clever! Your design is beautiful! I love how simple it is. And for a first quilt, paper pieced hexies are quite the challenge. Nice job! This looks really lovely and you certainly have one lucky partner. Oh my. I think this is fabulous! Keep up the good work! I feel the same. In fact, if you're pondweed, I'm the mud at the bottom of the pond. Love the colors of your quilt, I'm SOOO into yellow and orange right now! I love it, it's gorgeous! Fantastic design and colors.